STRIATED, SKELETAL MUSCLE | Microanatomy Web Atlas | Gwen V. Childs, Ph.D.
Skeletal muscle is cut in cross section in the above photograph. You cannot see the striations, but you can identify this tissue as skeletal muscle by the peripherally located nuclei (see the dense blue spots around the large pink fibers.) The connective tissue layer that you remove to reveal muscle in Gross Anatomy is called the epimysium (not shown in this view). 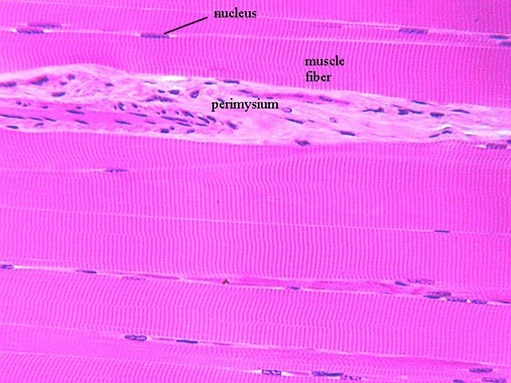 Denser connective tissue, called "perimysium" divides the muscle into bundles, called fasicles. You can find perimysium on the above photo. Finally, loose connective tissue called "endomysium" surrounds each muscle fiber. Make sure you can trace the outline of a complete fiber so you can understand how muscle is organized. 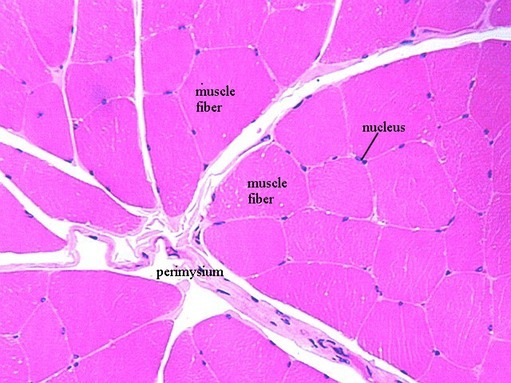 Above is a photograph of skeletal muscle cut in longitudinal section. The thin blue nuclei are found at the periphery of each cell or fiber (which is multinucleated). You can also see the striations. In the middle of the section is a connective tissue division, called "perimysium”. This cross section of skeletal muscle includes a profile of a muscle spindle. 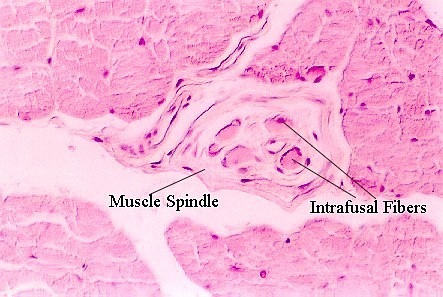 It is distinguished by layers of connective tissue surrounding centrally located nerves and muscle fibers, called "intrafusal fibers". What is the function of a muscle spindle and what is the significance of the close association between the intrafusal fibers and the nerves?